Here are the covers for my next two books, Strange Visitors, a collection from NewCon Press, and the novella Famadihana on Fomalhaut IV, from PS Publishing. Strange Visitors collects ten short stories and contains an original “P.O.O.C.H.”, written especially for this volume – a semi-autobiographical (in the loosest sense) account of owning a dog. Last year we acquired Uther, a red and white setter, and our lives have never been the same. 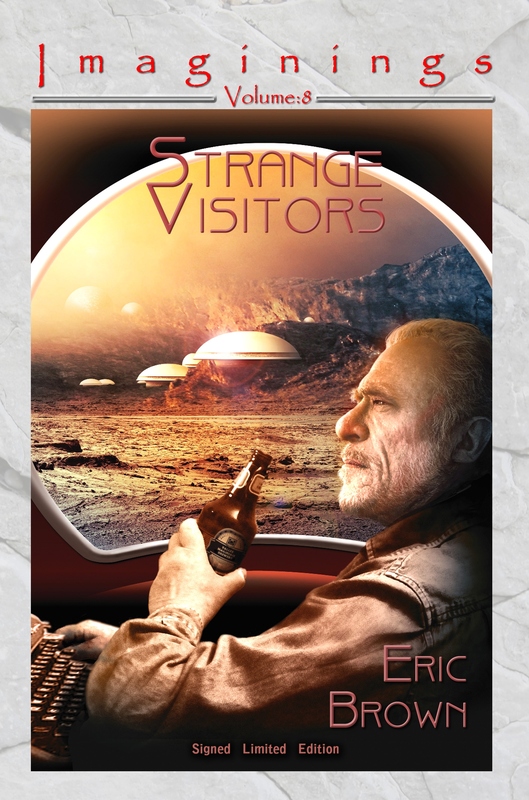 The fine cover by Jim Burns illustrates one of the stories, “Bukowski on Mars, with Beer”, and shows Buk on Mars… with beer. 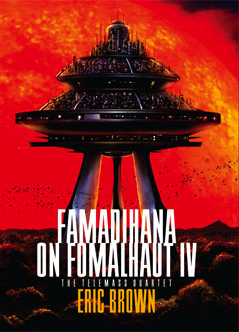 Famadihana… is the first in the Telemass Quartet, each novella following Matt Hendrick as he Telemasses to a different colony world in search of his ex-wife and daughter. The stunning cover, showing the Telemass Station against a fulminating red giant, is by Tomislav Tikulin. Both titles are out next month, April, and will be launched at EasterCon in Glasgow. NewCon Press and PS Publishing will be hosting a joint launch party for a number of their titles on Friday the 18th. I plan to get over from Dunbar, so hopefully I’ll see you there. The next novel, a steampunk adventure, Jani and the Greater Game – volume one in the Multiplicity series – is almost finished. I have a little fine tuning to do, then I’ll submit it later this month. This is one of those happy books which almost wrote itself, as if Jani herself were dictating the narrative. If all novels came as easily! On the short story front, I’ve recently had tales appear in Daily SF and MoonShots. Forthcoming are stories in Gary Dalkin’s Improbable Botany, and a story written with Keith Brooke which will appear in Ian Whates’ anthology about the Fermi paradox, both later this year. I like the idea of drinking a beer on Mars. I can’t say I’ve encountered the subject matter before and it certainly makes for an interesting cover. Best of luck with both books! Many thanks, G.B. I liked the idea of setting Bukowski loose on Mars! Eric, here at PS Publishing’s suggestion. Possible to email regarding an interview? Forgive me for doing this here, I couldn’t find your contact details on your site.